Size and revolutions per minute play a key role. 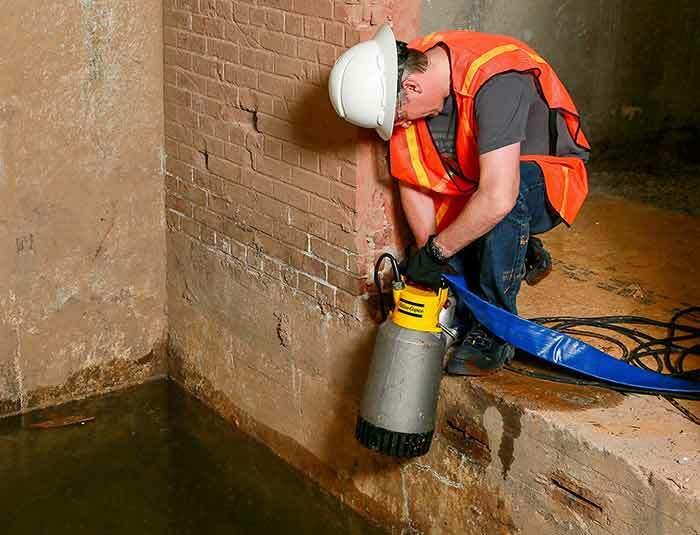 When it comes to groundwater and stormwater applications, selecting the right pump is crucial. The most common reason pumps fail is due to a misstep during the pump selection process. Using the wrong pump can mean expensive, critical errors—and a big mess. Prior to selecting a pump, the application should be known. What type of water is being moved and where is it being moved? Begin by looking at elevation change, distance and flow. The elevation change determines the pump strength needed to overcome gravity resistance. The suction elevation from the water to the eye of the impeller and the discharge elevation from the eye of the impeller to the water’s destination should be known. By adding these two numbers, the sum total elevation (gravity resistance) will be revealed. The distance determines if the line size should be increased to reduce friction loss due to friction resistance. Friction occurs in all pipes and hoses when liquid travels through. Two things that affect friction are the velocity at which the product is traveling through the pipe or hose and the overall distance of the pipe or hose to the delivery point. The distance from the suction point to the water’s destination needs to be known. Additionally, if pumping into a piping system that requires a certain pressure, the pressure required must be converted into equivalent feet of static head. For the static head measurement in feet, multiply the pressure required by 2.31. Valves and fittings also add resistance to flow. The sum of the elevation and the distance results in the total dynamic head, which is the total resistance in a pumping application. Measure the vertical elevation (measured in feet) and add the distance velocity of fluid moving through a hose or pipe (measured in feet per second) to obtain the total dynamic head. Plot this information on a pump curve to determine the best pump for the job. Why is it important to know how far and where the water is going? This determines the flow required. The distance needed to move the water and the elevation change both make a difference due to friction losses. The flow will determine the line size. Optimal flow avoids water flowing in a flat manner, called laminar flow, when it moves through a line at a slower rate, and turbulent flow with significant friction loss and possible cavitation when it moves through a line at a greater rate. Electric submersible pumps excel in deep groundwater. 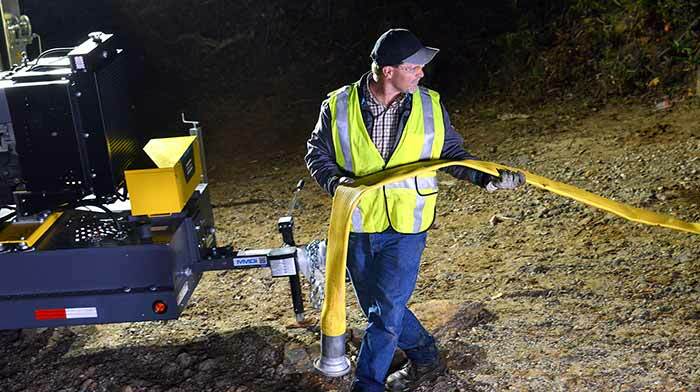 Well-point pumps work well in less than 25-feet-deep groundwater systems and are highly efficient. 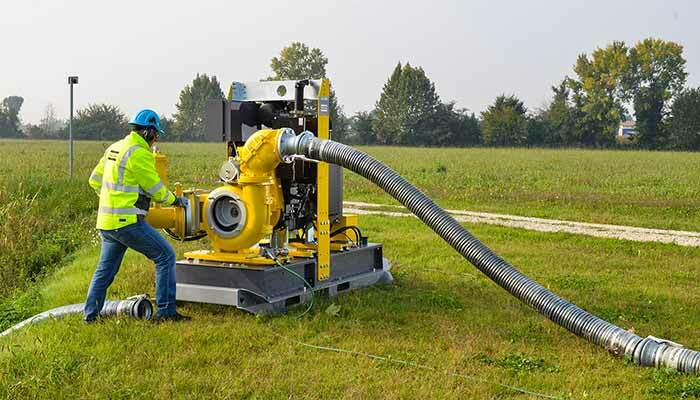 They are designed for long, straight pipes in the ground as well as when digging a construction site. Centrifugal pumps excel in situations where there are solids and trash. A great example is sewer applications. Size and power:The biggest reason pumps fail is due to incorrect sizing. For example, there might be too much horsepower and not enough flow, which can produce a rattle that could lead to the pump coming apart. Selecting the wrong size can lead to seal, impeller and shaft failures. Hose: Selecting the right hose is as important as selecting the pump. Discharge hose or high-density polyethylene (HDPE) can lower friction losses, but it all depends on the distance. The general rule of thumb is that for anything under 1,000 feet, use the same line size as the pump suction and discharge. For anything over 1,000 feet, use the next largest size hose or pipe as the pump suction and discharge. The exception to this rule is with HDPE pipe. Control box and technology: A full-featured control box is important especially if what is pumped varies in flow. The level transducer, pressure transducer and floats help regulate the flow. The pump can be turned on and off from a cellphone with remote start and stop. Image 2. During the pump selection process, also consider size and power, hose type, control box and technology, rpm and solids handling capability. Revolutions per minute (rpm): Just like with a car, if the pump is run too hard, there will be more problems. Each pump has a sweet spot, and the more consistently the rpm is in that zone, the better fuel consumption and maintenance will be. Running the pump at a low rpm will result in a longer-lasting pump. Solid handling capability:Being able to pass the correct solid size is important for maximum uptime. Strainers also play a role in this and should have a total open area of suction five times greater than the area of the suction hose. If renting a pump, know the distance, elevation change and the type of water. With this information, any reputable pump solution store will be able to provide the correct pump. If buying a pump, it is generally because a solution is needed often as similar issues keep occurring. A good salesperson will be able to use the distance, elevation change and type of water to suggest the right pump(s) for the application(s). Pick the correct hoses and fittings. Run it at the lowest rpm. 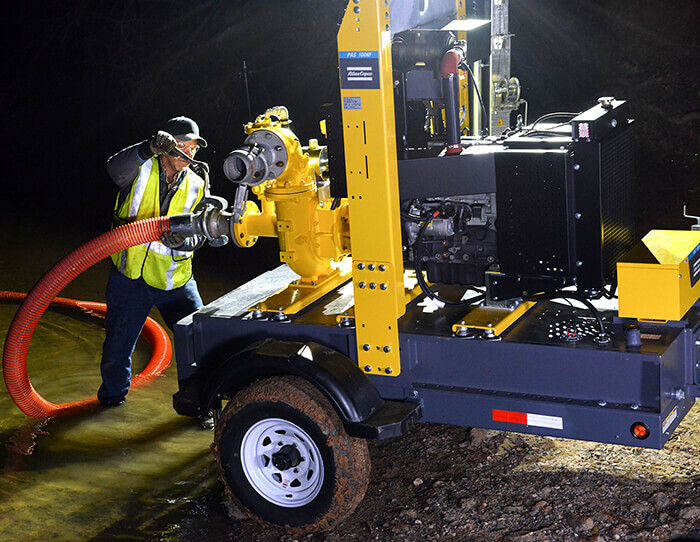 Joe Moser is product manager—pumps for Atlas Copco Power Technique. He may be reached at joe.moser@us.atlascopco.com or by calling 303-898-6978. For more information, visit www.atlascopco.com.